- No payment needed, just a completely free 7 day trial! Do visitors bounce or abandon their shopping cart? 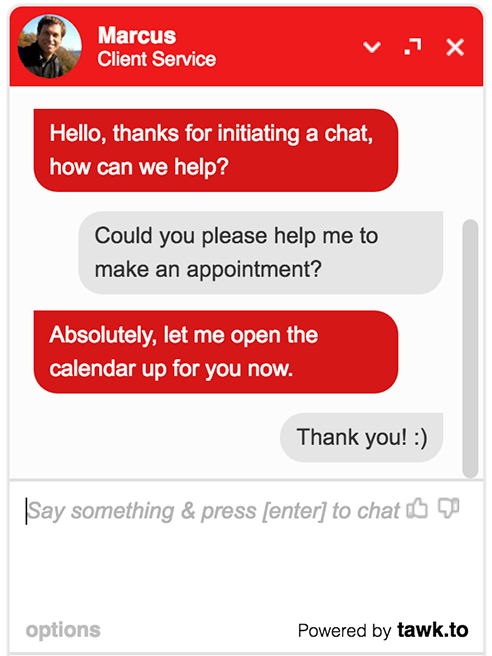 More leads, more sales and happier customers - that's what hired chat agents deliver. We'll be there for your customers, right when they need you the most - 24x7-365. Highly qualified leads - That’s what our expert agents can deliver, resulting in better Advertising ROI. English? Italian? German? French? Spanish? Our team of native speakers, speak your customers language. Offering Live Answering as a service is core to our revenue model, and it is how we're able to offer the software completely free to over 2,200,000+ (and growing) business users. Currently we get paid to answer chats for a small number of awesome clients that do not want to (or simply can't) answer the chat themselves. From Restaurants to Banks, Colleges, some medium & large e-commerce sites etc. Why would I want to hire agents 24x7 for $1/hr? Live chat has proven to increase leads, inquiries and overall customer satisfaction - but often, the biggest challenge businesses face is how to hire staff to ensure you're always online when your customers need you. Hiring live agents with tawk.to is "Your business, powered by our support team". Your customers will think they are chatting with your in house staff, right on your website. Nothing is worse for a visitor than when they can't find what they are looking for on your website. The visitor may simply need to ask a quick question before making a purchase decision, and nobody is there to help. Our dedicated, native speaking experts are fully trained in customer service and lead capture and can assist and guide your visitors when they need help right away. ?How does the service work? Prior to allocating Live Agents to your project, we undertake a full audit of your requirements & any systems or processes we need to put in place to ensure we best represent you and your company. We have developed a process to help us collate all the information agents will need to answer the queries of your website's visitors correctly and efficiently; please do take some time to go through the questions and provide detailed answers to each. The more information we have, the better equipped we will be to service your website visitors. ?Why should I hire tawk.to agents to answer chats from my website? Many businesses don't have the staff available to have a real live person ready and available to answer incoming chats at all hours of the day. When you hire our team of highly trained chat agents your visitors will be able to chat live with a real live person when you or your staff are unavailable. You can have our agents answer all incoming chats or use our agents only when your staff is unavailable to answer. You set the schedule and we follow it! ?What is the pricing for hiring live chat agents? ?Why is the pricing for hiring live chat agents so inexpensive? ?How many chats will you accept from my website at the same time? ?How are your agents trained to be able to answer questions from my visitors about my products or services? During the signup process you will be asked to provide information about your business. Think of it as FAQ's. You tell us what type of questions we can expect from your website visitors and provide the answers to those questions. Our project managers will review your website and add any information we find pertinent to your business or service offering to the knowledge base. The knowledge base is basically a database of information about your business or service. This information is available to any agent that answers an incoming chat from your site. ?What if the agents are unable to answer my customers question? There will be times when our agents won't know the answer to a question being asked and we will need more information from you or your team. In the future if the same issue or question arises our agents will be prepared with the proper answer. Our agents are trained to get the correct information to your visitors. We never "guess" the answer. ?Can agents proactively engage with visitors? ?Can I chat with my website vistors when the tawk.to agents are scheduled to be answering chats? You can view all chat transcripts and messages in the tawk.to dashboard. You can even have all chat transcripts emailed to you directly after a chat has ended. Just login to https://dashboard.tawk.to and click the messaging icon in the left sidebar of the dashboard. If our agents feel a message is urgent we will contact you right away. ?What hours are the live chat agents available? ?Do I have to sign a contract? ?Do you charge for lead capturing? No we never charge you for capturing a sales lead. We don't charge on a per lead basis. ?Where are your chat agents based out of? Tawk.to is registered in the USA and United Kingdom. ?Which languages do your agents speak? ?Can agents answer chats from multiple businesses and/or websites? Absolutely - though we bill on a per site basis, due to the body of knowledge required for each separate use-case. ?Will I have a direct point of contact? Absolutely! Upon sign up, you will notice a new "Group" in your dashboard, that gives you direct access to our management team here at tawk.to; and each of the agents that will be answering on your behalf. 24x7 you can message us to provide input and feedback on how we're going, as well as whisper messages directly to the agents to guide them during any situation in chat that may arise. NOTE: Limited Availability - We limit the number of new customers that this service is offered to, as providing Customer Service as a Service with a level of quality that our customers have come to expect, requires proper staffing and quality training. Humans don't scale like software. If you would like to hire live chat agents to assist with your live chat answering, now is your opportunity. We receive way more requests for hired agents than we could ever hope to service, so please get in quick to avoid disappointment. Please initiate a chat now to get started with a free 7-day trial, your customer success team are standing by 24x7-365 to asses suitability for your product or service offering, and the expertise of our trained agents.